There it is, Allah’s book, this is the basic catastrophe. I don’t know what day it is of this disgusting month of Ramadan! 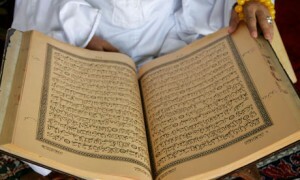 You are making the tearing of the Quran such a big and dangerous thing… it is instinctive to tear this book, those sons of [profanity] think they can threaten me and challenge me to tear the Quran, but I want to prove to them that they are nothing and what is the big deal in tearing this book!! There it is [he starts tearing the Quran] in the trash. Are you feeling better now! You cannot touch a hair on my head! We keep blaming Hamas and Gaza, but it is not them, it is this son of [profanity] book that I am stepping on right now. That book is the source of all evil and the real catastrophe. There is nothing new here, it is not Omar Abdel Rahman, Abbud or all the others; it is this garbage that is causing us to run in a demonic never-ending circle that will never end. While this latest Koran desecration is a reminder that there are everyday Egyptians who are sick of the Talibanization of Egypt, a recent talk show on Al Hafiz channel concerning this incident is an indicator of what is in store for them. Someone like him must receive the punishment he deserves—and it is death. He is an apostate… It is clear from what he says that he is a Muslim, and must be killed as an apostate. As for that act itself, it is an infidel act, and he deserves to be struck by the sword in a public place—and as soon as possible; as soon as possible; as soon as possible. It must be announced and photographed and disseminated among the people, so that all the people may know that we respect our Koran and its words from Allah, and whoever insults it, receives his punishment from Allah. If people like him are left alone, they will only get bolder and bolder. Simply put, the host was wrong to think that those who insult Islam should only be killed by the state. Any good Muslim can—and should—kill them, wherever he finds them. Of course, with a Muslim Brotherhood president in office, whether those who offend Islam are killed by the state or by Islamic vigilantes becomes somewhat semantic. Already under President Morsi’s first two months, Islamists have become more emboldened—whether by pressuring women to wear the hijab, killing a Muslim youth for publicly holding hands with his fiancée, or disseminating flyers that call for the total genocide of Egypt’s Christian Copts—flyers that even openly included names and mosque contact points for those Muslims who wish to collect their rewards for killing Christians.